In spite of Washington’s claims that it pursues an Afghan settlement, it has been reluctant to put an end to its military campaign in this country, trying to secure the alignment of political chess pieces on the Afghan board in a such a way instead that it will ensure this country becomes obedient and more in line with the status of a vassal. It is noteworthy that the US special representative for Afghanistan reconciliation, Zalmay Khalilzad, has been particularly active in the past two months, as he held a series of personal meetings with both Afghanistan’s president Ashraf Ghani and the high-profile figures within the Taliban. If one is to pay close attention to the recent steps made by this senior US diplomat, it becomes evident that Washington demanded Khalilzad establish close ties with a multitude of militant Afghan field commanders, as they are capable of bringing large armed groups to virtually any part of Afghanistan at will. Thus, during his last tour across the region, the US special representative for Afghanistan reconciliation would hold a personal meeting with Tadin Khan, the brother of the assassinated police commander of Kandahar – Abdul Raziq. During the meeting, which took place in the UAE, Khalilzad was able to clarify that Tadin inherited a lot of power from his deceased relative and could lead a number of armed groups into combat. Unsurprisingly, by a miracle that some would describe as a strange coincidence, at the same exact moment the former governor of the Balkh Governorate of Afghanistan, Atta Muhammad Nur was visiting the UAE. It’s noteworthy that Khalilzad was born in Mazar-i-Sharif – the capital of Balkh, so he had a cordial meeting with his fellow countryman, as Nur has ties to a number of armed groups that operate in the province he used to govern. A series of such meetings not held openly or officially, as one would expect from a high-profile diplomat, seek to ensure that Washington can use semi-legal armed formations in a major crackdown on opposition forces controlling the better part of Afghanistan. This plan becomes particularly relevant in the light of the upcoming withdrawal of some US troops from Afghanistan. This shadowy aspect of Washington’s “peace plan” for Afghanistan goes in line with a number of reports in the US media that indicate Langley has intensified its efforts in creating a parallel power structure across Afghanistan that will not answer to Kabul and will operate under the guise of a joint anti-terror effort coordinated by the CIA. The approximate number of men engaged in this proxy force reaches tens of thousands. These activities are taking place behind the guise of operation Resolute Support conducted by the Pentagon and in close coordination with representatives of those Afghan figures controlled by Washington. Units that Washington has been busy training will not be just fighting the Taliban but will also be punishing the local population for their cooperation with this group. What is clear is Washington’s vision of tomorrow’s Afghan peace is riddled with punitive methods. However, this smoke and mirrors approach is nothing but preparation for the deployment of so-called private security firms in Afghanistan, which will be coordinating their activities with Afghan field commanders from day one. Essentially, this will lead to the division of the country, with seemingly independent zones of influence being established, which will ultimately result in the destruction of the very foundation of the Afghan state. This situation requires immediate attention from all nationals who deem themselves Afghan patriots and leading figures of the international community. Otherwise we’re about to see the rise of a multitude of mercenary fiefdoms in the place of a proud state that Washington failed to subject to its will. The role of US special representative for Afghanistan reconciliation, Zalmay Khalilzad plays in the “peace plan” that will result in the demise of the Afghan state is no coincidence, as he has been enjoying close business ties with the founder of the Blackwater, Erik Prince for quite a while. In turn, Prince happens to be among the principal lobbyists of the “bright” Afghan future we’re about to witness. But things are not going Khalilzad’s way in his contacts with the Taliban movement. There’s signs that the negotiation process may be coming to a screeching halt, which affected the withdrawal schedule of regular US troops from Afghanistan. Among the reasons behind this is the absence of any guarantees that the Taliban would not try to undermine Washington’s reign throughout the mercenary kingdoms that would replace Afghanistan. It’s clear that verbal claims that Taliban’s field commanders are making about them having no intention of seeking a monopoly on power are not good enough for Washington. 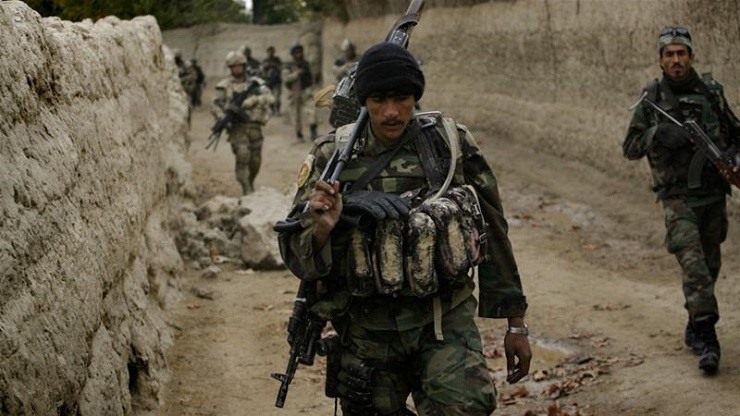 It’s also clear that the United States demands unequivocal consent from the armed opposition for it to maintain its bases in the territory of Afghanistan indefinitely, as it needs these to project its influence in the region. It is for this reason Zalmay Khalilzad was demanded to seek rapprochement with Islamabad for it to assist the US in negotiating the peace deal with the Taliban to the detriment of Afghanistan and its people. Under these conditions, the withdrawal of US troops could lead to a rapid deterioration of the security situation in Afghanistan. Further still, in a bid to prevent other international players (namely Russia) from resolving the Afghan crisis through negotiations with all parties involved in the conflict, Washington demanded the US-controlled representatives of the ruling Kabul elite to discredit the role of the Russian Federation in the establishment of a viable peace process, by describing Moscow as an unreliable partner. To facilitate these efforts, all sorts of fabricated “leaks” about the Kremlin’s alleged involvement in the financing and arming of the Taliban began appearing across Afghan media and on social networks. By sensing a direct threat to his power and wealth in Russia’s growing ties with opposition forces of Afghanistan who represent local minorities, the sitting Afghan president Ashraf Ghani chose to organize a press conference to publicly criticize Moscow and its efforts in early February. Political analysts agree that Ashraf Ghani doesn’t have the support to beat main competitors in the election race, especially in a situation when those competitors can show that they are capable of using Russia’s assistance in bringing peace to Afghanistan. That is why he’s going to block all attempts Moscow makes in its bid to defuse a potentially catastrophic situation in Afghanistan, and Washington seems to be more than content with this fact.